Seismologists, geologists who study seismic waves noticed in the early 20th century that P waves bended, or refracted, in their journey through Earth. Observations at stations far removed from the earthquake focus recorded waves that had traveled through the planet’s interior, as illustrated in part (1) of the figure.. Travel times of these waves indicated a refracted path, as shown in the figure, and wave speed is the distance divided by time (as determined by the amount of time elapsed since the start of the earthquake). Refraction was not too surprising because the increased pressure in Earth’s interior results in firmer structures and more resistance to oscillation, so the wave speed is greater and seismic waves refract. What surprised early seismologists was that beyond a certain point about 7,200 miles (11,600 km) from the focus, at an angular distance of 105 degrees S waves disappeared! In 1906 the British seismologist Richard D. Oldham (1858–1936) proposed that the disappearance of the shear waves was due to the “shadow” of a liquid core. 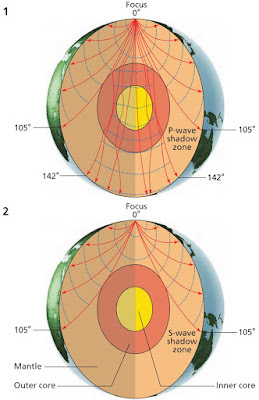 Since S waves are shear, they cannot propagate through liquid, so the existence of a liquid center inside the planet would explain why seismometers fail to record shear waves on the other side of the planet from the focus, as shown in part (2) of the fi gure below. P waves, being compression waves, refract at the boundary between rock and liquid, creating a smaller “shadow.” Th e rocky interior beneath the crust is called the mantle, and in 1914 the German seismologist Beno Gutenberg (1889–1960) used the seismic wave results to calculate that the mantlecore boundary is located at a depth of about 1,800 miles (2,900 km) below the surface. However, in 1936 the Danish seismologist Inge Lehmann (1888– 1993) analyzed seismic wave data and discovered an additional refractory step of P waves. Her analysis suggested the existence of another boundary, which she placed at a depth of about 3,200 miles (5,150 km). This boundary is between an outer core and an inner core. The use of seismic waves to image Earth’s interior is similar to the use of ultrasound waves to image the body’s interior or sound waves in sonar to image the seafloor. 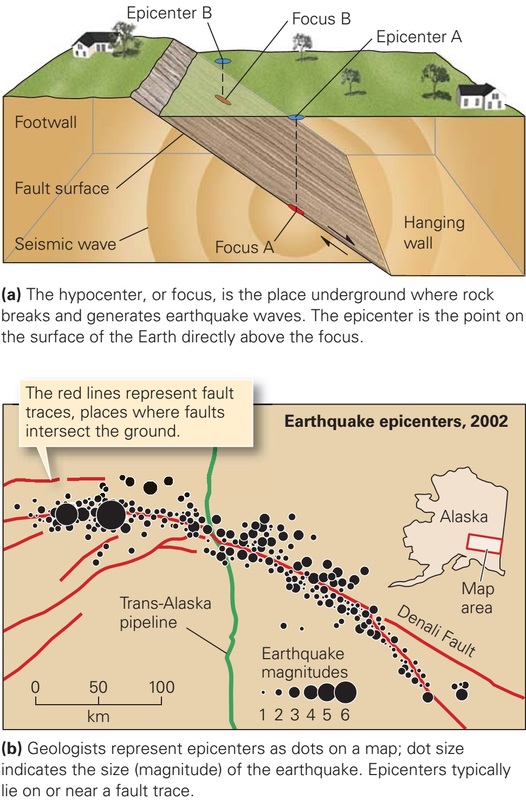 Unlike ultrasound and sonar techniques, though, seismologists usually do not generate seismic waves these are natural occurrences beyond the control of researchers. Yet the waves reveal a lot of information about otherwise inaccessible places. Seismic waves are also plentiful; about 1 million or so earthquakes occur each year in the world, and although most of these are fortunately minor they are detectable with sensitive instruments. inner core, which is solid, with a radius of about 750 miles (1,220 km). The mantle gets its name from Wiechert, who thought of it as a coat that covered the core (mantle derives from the German word, mantel, for “shell” or “coat”). 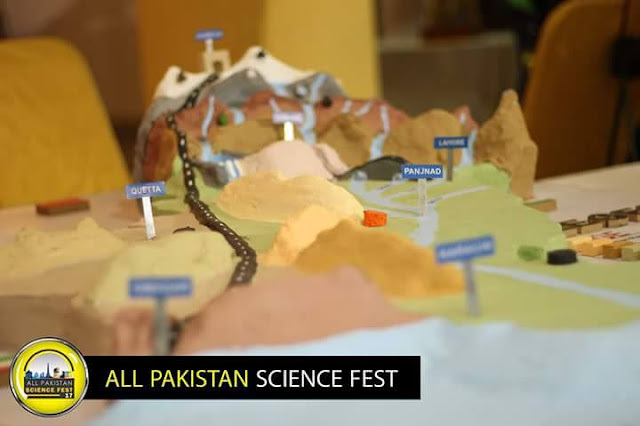 About 67 percent of Earth’s mass is contained in this large region. 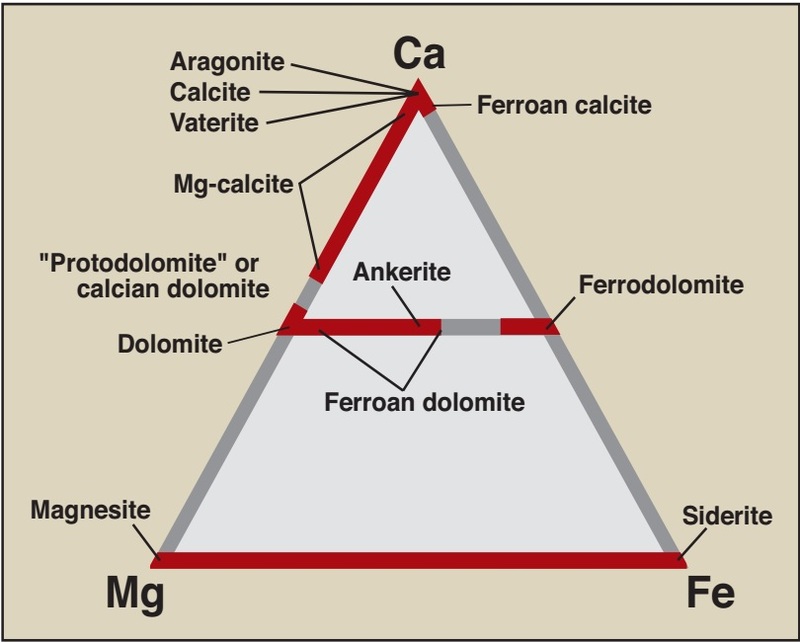 The mantle is mostly solid, although as discussed below there is some degree of fluidity in spots; it consists of minerals such as olivine and another silicate called perovskite (MgSiO3). Silicon and aluminium are less abundant in the mantle compared to the crust, but magnesium is much more plentiful. Wiechert assumed from the studies of Earth’s density that the core must be dense. A greater density for the core also makes sense because the large portion of the heavier elements would have sunk to the interior as the hot, molten planet formed long ago. Iron and nickel possess relatively high densities and are commonly found in certain meteorites, indicating their abundance throughout the solar system. These metals are likely constituents of the core. The absence of shear wave propagation indicates the outer core is liquid, but studies of other seismic waves indicates a density slightly less than that expected if the outer core contained only melted iron and nickel. Instead, the outer core is about 90 percent iron and nickel, and most of this is iron about 85 percent of the outer core is made of this element. The remaining 10 percent consists of lighter elements such as sulphur and oxygen. The inner core forms a boundary with the outer core, reflecting some of the waves and transmitting the rest. Shear waves cannot pass through the outer core, but as compression waves cross the boundary between the inner and outer core, some of these disturbances create shear waves. The shear waves travel through the inner core and get converted back into compression waves as they proceed from the inner to the outer core. Seismologists can detect the paths of these waves, and the propagation of shear waves in the inner core implies it cannot be liquid. Density studies suggest the inner core is mostly solid iron, mixed with a small percentage of nickel. Researchers continue to study seismic waves and similar data to learn more of the details on the structure and composition inside Earth. In 2005 John W. Hernlund and Paul J. Tackley of the University of California, Los Angeles, and Christine Thomas of the University of Liverpool in the Britain found data suggesting the presence of a thin layer around the mantle-core boundary. This layer, previously unknown and not yet widely studied, might help scientists to understand and identify further properties of the mantle. The researchers published their report “A Doubling of the Post-Perovskite Phase Boundary and Structure of the Earth’s Lowermost Mantle” in a 2005 issue of Nature. 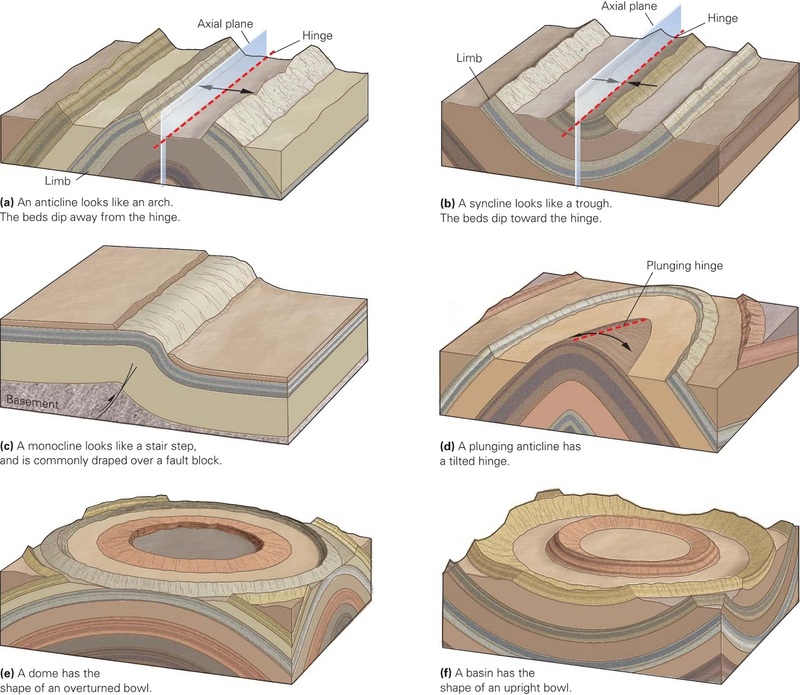 Although researchers can study the finer structure of Earth’s hidden interior with sensitive seismometers, a large amount of information could also be gained by burrowing inside and taking a look. There are limitations on how far down people can drill, even with the hardest bits (the tip of the drill), but researchers are sharpening their drill bits in the effort to reach greater depths.